Sioux City (LCS-11) during the ship’s moveout at the Fincantieri Marinette Marine yard in Wisconsin. Lockheed Martin photo. This post has been updated to include information from the Pentagon and Navy press conferences on the FY 2018 budget. THE PENTAGON – The Navy intends to buy just one Littoral Combat Ship in Fiscal Year 2018 – in line with its previous long-range shipbuilding plans but not enough to keep the two yards currently building LCSs open and competitive in the upcoming frigate competition. The Navy has repeatedly said it would have to buy three LCS hulls a year to sustain the workforce at Austal USA and Fincantieri Marinette Marine. However, its long-range shipbuilding plans were previously trimmed to two this current fiscal year and one a year going forward to keep in line with a December 2015 Pentagon decision to truncate the LCS program and move to a new frigate instead. The frigate program was recently pushed back by a year, though, from a planned 2019 start to 2020, putting Austal and Marinette in a precarious position if the Navy were to follow through with the Pentagon’s plans to only purchase one ship a year in 2018 through 2020. Acting Navy Secretary Sean Stackley told USNI News earlier this month that Austal and Marinette would have to compete in a full and open competition for the frigate contract in 2020, but he noted they may have an advantage in that they have hot production lines with the reduced costs that come along with that – giving them a potential quality and cost advantage over other bidders without production experience. Breaking their production line, however, would put people out of work and hurt their chances of winning frigate work. In December 2016, when Stackley was serving as the Navy’s acquisition chief, he told USNI News that having a continuous, steady backlog of work was vital to the health of the shipyards. “If the shipyard doesn’t have a backlog, it’s out of business,” he said, adding that the 2017 contract awards keep the yard busy through 2020 or 2021 but that new ships must continue to be awarded to keep the workforce and the suppliers busy. “What that means is, the day you award that last ship, you’re going to start laying people off, and you’re going to lay them off until they’re gone. You’re going to lay them off in the sequence in which you build the ship. So when you are going to build another ship, if you are going to stop production and build another ship, you’ve lost your skilled labor and you’ve got to rebuild it,” he said, which would apply to the LCS to frigate transition, as an Marinette- or Austal-built frigate would be based off the Freedom- or Independence-variant LCS, respectively. Littoral combat ship USS Coronado (LCS 4) patrols the Pacific Ocean during flight operations in the 7th Fleet area of operation on Oct. 6, 2016. US Navy photo. 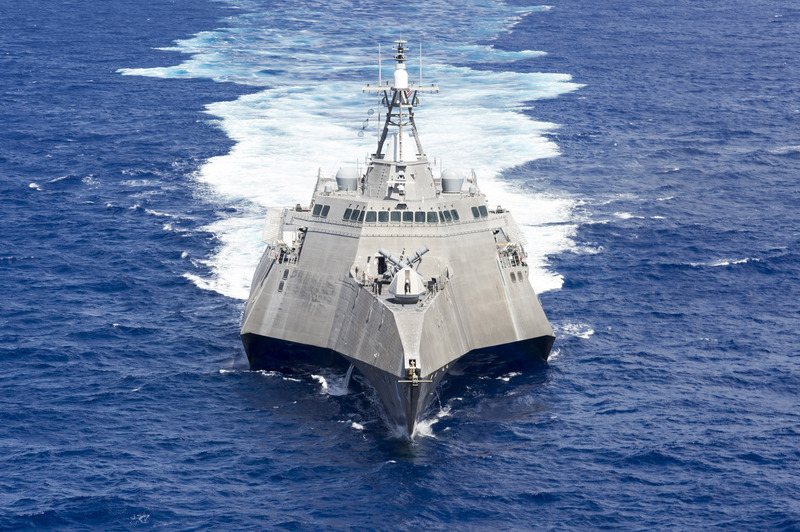 Program Executive Officer for LCS Rear Adm. John Neagley said at a conference in January that keeping the hot production lines would be important for the frigate program – though at the time the competition was still limited to just Austal and Marinette. “Leveraging a hot production line is kind of a key strategy for us. In terms of LCS, we have two production lines at two shipyards; taking advantage of that investment that already has occurred in the shipyards both from a people standpoint and infrastructure standpoint is important,” Neagley said. In a budget rollout briefing today, Deputy Assistant Secretary of the Navy for Budget Rear Adm. Brian Luther told USNI News that the decision to buy only one ship was not meant to affect the industrial base. Rather, he said, the Navy is still counting on both yards remaining viable for the frigate competition. “The intent is to have two shipyards competitive in 2020. The Navy seeks to have a competitive bidding process,” he said. Sen. Tammy Baldwin (D-Wisc. ), who represents the Marinette Marine shipyard that builds Lockheed Martin’s Freedom-variant LCS, wrote a letter directly to President Donald Trump on May 12 to request funding for three ships in 2018, and the letter implies that reduced funding now would lead to rapid layoffs – meaning that the Navy trying to address industrial base health concerns in 2019 or later would be too late. “In Wisconsin, only two LCS in FY18 would result in approximately 450 direct shipyard worker layoffs, or 20 percent of the workforce at the yard, and a total of 1,200 jobs lost across the state. Only one LCS in FY18 could result in up to 800 layoffs at the shipyard, or 36 percent of the workforce, and a total of 1,850 jobs lost across the state,” reads her letter. 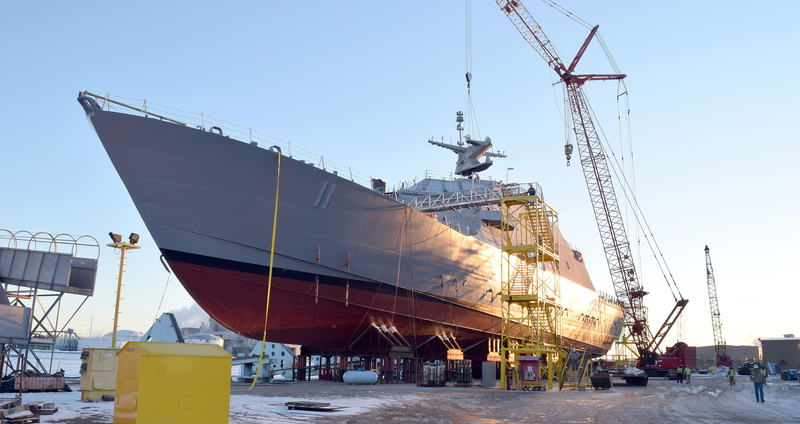 “Layoffs of this magnitude would have dire impacts on the ability of the Marinette shipyard and supply chain to compete for the Navy’s Frigate, which will soon follow the LCS,” she continues. Lawmakers like Baldwin may be able to force the Pentagon’s hand, though. This current fiscal year, the Navy requested just two LCSs, in line with the trimmed-down long-range shipbuilding plan. Lawmakers added funding for a third to sustain the industrial base. With the House and Senate armed services committees already pushing for much more defense spending than the Trump administration previewed in its “skinny budget” in March – HASC chairman Rep. Mac Thornberry (R-Texas) said he wanted to see about $40 billion more for defense than the administration called for – LCS spending is sure to be a hot issue to watch this summer.